MAKING YOUR EQUIPMENT HARVEST BETTER. When harvesting pulse crops, Ag Shield Cross Augers provide the most efficient and cost-effective experience on the market. With unique features like our Flex-End™ Technology; Patented Stripper Bar; Swept-Back Paddles and compatibility with almost any Draper model available, Ag Shield Cross Augers outperform the competition. Cross Augers are ideal for improving your harvest while working high-volume crops that are harder to feed such as peas, canola, forages, mustard, etc. The auger helps move tall and bushy crop into the center of the combine header quickly. Ag Shield Cross Augers offer unique-to-market features such as our Patented Stripper Bar that directs crop into the auger faster for optimal flow and increased combine speed. Ag Shield's Swept-Back Paddle design prevents wrapping at the bullet auger (competing augers with straight paddles tend to cause wrapping around the auger). Our patented Flex-End™ design features a Center Chain Coupler, eliminating the need for grease. No more high-wear parts like u-joints to have to deal with. Flex-End™ connection between the header and the auger ensures seamless movement while in operation, effectively minimizing risk of damage. Ag Shield manufacturers cross auger kits for ALL makes, models and lengths of swather and combine headers. Our Flex-End™ technology enables the Ag Shield Cross Auger to be compatible with both flex and rigid drapers. The Flex-End™ Cross Auger offers universal compatibility between models of the same length of header (ie. our 40' cross auger fits ALL MacDon 40' FlexDraper and Draper headers from the past 15 years). Ag Shield's patent-pending Flex-End™ design allows for our cross augers to operate on both rigid and flex draper headers. The auger is connected to the header through a multi-cord bonded-rubber joint that allows for the seamless movement of the auger as it follows the movement of the header. The Flex-End™ Cross Auger also features a center chain coupler. This is in place of the traditional u-joint or rubber mount seen on many competing augers. The chain coupler negates the need for grease and minimizes the maintenance that generally comes with high-wear parts like u-joints and rubber mounts. Each Ag Shield Cross Auger comes standard with our patented Angled Stripper Bar. The bar is situated just below the auger and effectively directs crop from the header to the auger for a quicker feed. The angle of Ag Shield's bar is not 90° (as some competing bars are), this is to ensure that the bar actually streamlines the crop's path to the auger instead of keeping it away form the auger. This feature allows Ag Shield Cross Augers to provide a faster flow than any other auger on the market. The center paddles of an Ag Shield Cross Auger feature a swept-back design with a 45° angle. Unlike some competing augers with 90° paddles, the 45° angle allows the paddles to "unload" the crop by pushing it away from the auger and into the drum fingers, reducing the risk of the crop wrapping on the auger. 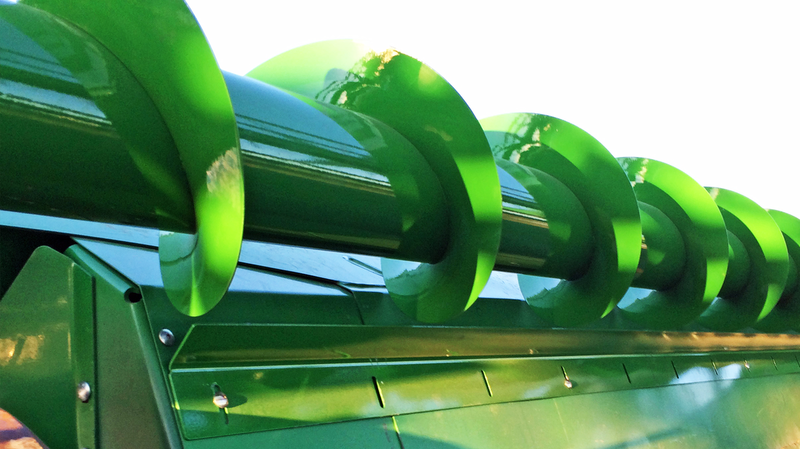 Our cross augers span the full width of your header, allowing for lodged crop to be taken from the very ends of the header to the center auger. Coarser 16" pitch (allows for reduced rpm and helps eliminate wrapping in all conditions). Hydraulic driven augers with independent motor speed control. Complete bolt-on kits making installs quick and easy for all models. Urethane paint coating for long-lasting shine to match your header. with my other 4 Ag Shield equipped combines. Ag Shield Cross Augers are available for almost any make, model and size of combine or swather headers (ie. John Deere, MacDon, CASE IH, Honey Bee, New Holland, AGCO, etc. ).